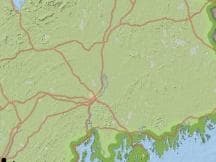 为该重建提供数值的气象站是：Bangor International Airport (66%、20公里、西南)；Hancock County-Bar Harbor Airport (14%、56公里、南)；Millinocket Municipal Airport (8%、81公里、北)；Greenville (6%、97公里、西北)和St. Stephen, N. B. (5%、113公里、东).